With this week, the last of the Summer 2017 anime are finishing up as we prepare to enter the Fall season in the beginning of October. As you might remember, I took a brief look at some of the shows I’ve been watching this season, and decided to revisit them before we move on to the shows that await us in the coming weeks. First, I would like to express a small amount of disappointment in there being a Christmas tree absolutely plastered with gears and cogs in a setting that was previously fairly subdued in comparison to other cyberpunk works. That aside, the show ended in a great place character-wise even if it wasn’t necessarily the best ending for the overarching plot. The backgrounds and motivations of all of the main spies except for Beato were explored, with Charlotte and Ange baring their hearts to each other in the final episodes and coming to terms with what they want for the kingdom. As for the plot, the final confrontation against Gazelle and Zelda was anticlimactic, but it sets the stage for a sequel fairly well, so I hope that a more suitable conclusion will be able to be reached eventually. My few other complaints are that the focus tends to stray away from espionage and towards action sequences and chases, although these tend to be entertaining, and that the C Ball seems to have become more like a superpower than an experimental technology with limited uses. That being said, I still had fun throughout its entire season, and both its spy antics and its fight scenes / car chases were entertaining regardless of the ratio they appeared in. Unfortunately, Virgin Soul began to suffer as it reached the end of the season. For some reason, the king Charioce who has committed genocide and enslaved most of a race is forgiven and given a happy romantic ending with Nina, with her main motivation behind forgiving him being a mix of “because of I love him” and him secretly working towards destroying the catastrophic Bahamut. It reminds me of games like Bravely Default, where the antagonists who are secretly working towards something like preventing the end of the world refuse to tell anyone else about their plans until the very end. What seemed like an antagonist who uses detestable means to achieve something good and is prepared to face their consequences ends up as someone heralded as a hero by everyone, so much so that at the end they paint a mural of him heroically leading his army atop a white horse. Perhaps even more confusing were the resolutions of other plot points; the “chosen one” half-angel is murdered after not accomplishing much, the previously malicious demons now work alongside the humans for pay, the dragon hunter (who is also a dragon) is only relevant for one episode before dying, and the gods are off doing who knows what. Of course, they also leave room for a sequel by hinting that, after all of this, Bahamut still isn’t really dead. For all of these complaints, almost all of the good points I made in my previous article remain. The action sequences are great, it has some fun fantasy adventure antics with a good soundtrack, and some of the characters can still be charming. In all honesty, I’m reminded of Darker than Black, in that both of these shows had a somewhat disappointing second season made worse by coming directly after a great first season and utilizing recurring characters less effectively. Although I was a bit disappointed that the anime didn’t go further in the story than it did, I will admit that the point at which it ended was emotionally powerful. The voice acting and soundtrack were really stellar, and made some of the final moments of the anime absolutely heart-wrenching, despite having read through the manga. When talking about the show previously I mentioned being somewhat wary of how some of the more graphic scenes were going to be handled, but they were every bit as disturbing as I could have hoped for in animated form. I feel as though some of Ozen’s scenes could have been handled better, but the encounter with the orbed piercer was as gruesome as I remembered it being in the manga, and seeing Mitty’s transformation animated was great. I was not a fan of some of the additions that the anime made, such as the narration and the extra scenes in the Great Fault, but the ending montage of preparing to delve further down as their letter rose back through the layers to the surface was a fantastic addition. I’m also not entirely convinced that Bonedrewd’s voice actor was the best choice, but to be fair we haven’t really seen World’s Best Dad in some of his more prominent scenes as of yet, and I can only hope that we’ll get the chance to see them animated in a second season. While Virgin Soul was a decent show that deteriorated a bit as it went on, Re:Creators was a show that already wasn’t great that ended up getting worse and worse as it drew to its conclusion. Meteora remained just as intolerable as someone who knows everything and is constantly explaining, the attempts at making statements about art, creation, the anime/manga business , and even cyber bullying were clumsy and ham-fisted, and the plot points that didn’t come out of nowhere for convenience’s sake (Magane) were predictable. It didn’t help that the antagonist was all-powerful, so much so that she had to be beaten by what is essentially the “power of love” cliche. It probably wouldn’t have been so bad if it hadn’t been dragging on over two season, but the poor pacing really took its toll by the end. I will once again stand by the action sequences being good, despite this show’s other flaws, but the show ending with Meteora writing a book about everything that happened called “Re:Creators” is enough of a slap in the face to make most good points moot. Despite taking the form of two specials, Owarimonogatari 2nd Season brought us two new openings: one for Mayoi Hell and one for Ougi Dark. Of course I like the song, but the visuals are my favorite part about this opening. As we’ve come to expect from Studio SHAFT, it’s not only stylish and relevant to the story, but it contains elements that are borderline spoilers. There’s not much to say about this animation other than that I think both the song and animation are pretty cute. 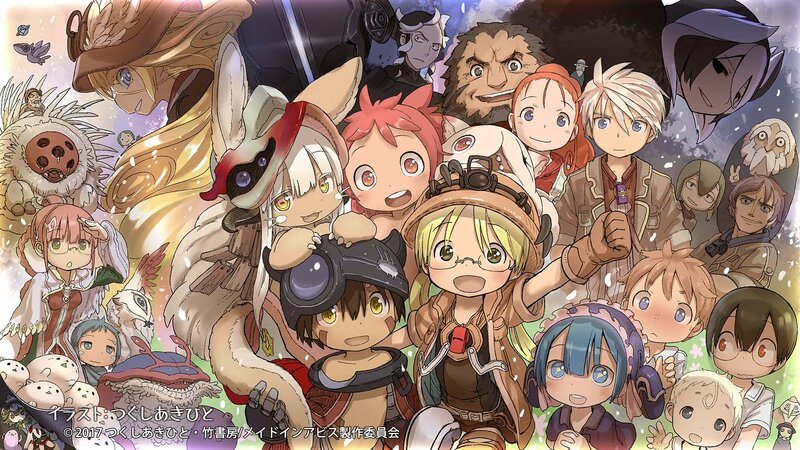 The ED for Made in Abyss was also pretty cute, with bonus points for the horrifying monsters being portrayed as cute side characters, but “A Page of My Story” is just too catchy. This Fall will bring about a lot of familiar names and faces, at least for me. Kino no Tabi is receiving a new adaptation and we’re seeing continuations of 3-gatsu no Lion and Kekkai Sensen, not to mention the proper release of Mahoutsukai no Yome (or, as it’s being marketed as in Western media, The Ancient Magus’ Bride). I was actually surprised to see that there will be another animated installation in the Garo franchise, although I can only hope it will be more like Divine Flame than Crimson Moon. As usual I’m not as adventurous when it comes to unfamiliar properties, but at the very least I’m interested in trying out Inuyashiki, Houseki no Kuni, and Ousama Game to round out my possible seasonal series to a solid eight. However, I am disappointed that I will have to wait another season for both Overlord and Pop Team Epic. Looking back at this Summer season, I would say that out of the four shows that I actively watched there were two that I really enjoyed, one that started out as decent, and one that wasn’t very good at all; in case it’s not immediately apparent, that would be Princess Principal and Made in Abyss, Virgin Soul, and Re:Creators respectively. Though it’s not saying much to point out that I didn’t stop watching any of these shows partway through, it’s more than I can say about some seasons in the past, so I would say that with these and the sprinkling of Monogatari that came this season that I was pretty content. There looks to be even more to enjoy in this coming season, enough to even make me cautiously optimistic, so I hope you’ll join me as we dive right in to Fall.